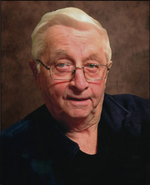 HADDOW: Daniel Gray, age 79 years, father to Scott, Tracy and Kim, passed away at the Brandon Regional Health Centre on Monday, March 11, 2019. A Celebration of Daniel's Life will take place at the Victoria Inn, Imperial Ballroom, 3550 Victoria Avenue on Wednesday, March 20, 2019 at 1:30pm with Joe Ball officiating. Daniel will be laid to rest, with his late wife Billie, at the Brandon Cemetery. A reception will follow at the Victoria Inn. Donations in memory of Daniel may be made to the Brandon Regional Health Centre Foundation, 150 McTavish Avenue East, Brandon, MB R7A 2B3. Complete obituary information will follow.